Titus has been open since 1980, and current owners Tom and Terry Rake purchased it from her father in 2012. 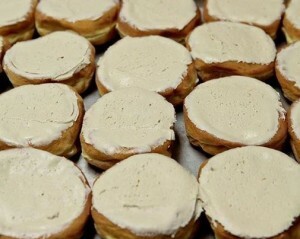 They bake about 30 doughnut flavors, but they’re best known for the Pershing. It’s a yeast doughnut with swirled cinnamon dough, topped with maple icing. Other great choices include cake doughnuts in seasonal flavors like pumpkin, filled doughnuts overflowing with chocolate or maple cream, and a maple-bacon doughnut topped with two full strips of bacon. Special for National Doughnut Day: Free doughnut holes. Click here for Indy Star article! Posted in In the News and tagged free donut holes, indy star, national donut day.